She’s running for her life. He’s a cowboy with courage enough to save her, but falling in love might just prove deadly. Jenna Montrose is on the run from the man who killed her father. Alone and always moving from town to town, Jenna trusts no one, not even the police. She arrives in remote Smokey Creek, outback West Australia, where she takes a job on a cattle station. It’s here she hopes to keep her identity, as well as her mysterious connection with animals, hidden. Dan Simmonds has demons of his own to conquer, having spent two years in jail for a crime he didn’t commit. He needs this work as a stockman to re-build his reputation. But he can’t seem to shake the protective instinct Jenna awakens, when he sees through her lies to her desperate vulnerability. She’s so full of contradictions and secrets, he’s not sure she’s worth fighting for. When they become trapped together in the desert, Dan admits she provokes emotions he thought buried deep. Jenna is drawn to Dan’s courageous heart and welcoming smile, but desperate not to reveal her secret, will she revert to her habit of running away when the murderer reappears? Or will she let him help her, and turn the hunter into the hunted? 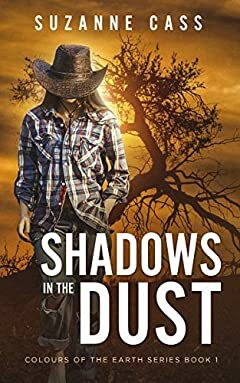 Get Shadows in the Dust today if you love an intriguing thriller with romance at its core. While the characters overlap, each book tells a different, separate story with a happy ever after ending.